Print My Cal is an excellent web tool that allows you to edit and print beautiful Google calendars. We have been tinkering with it for sometime now and we found it really interesting. Google Calendar comes with an integrated print feature but with Print My Cal you will have access to a wide range of printing options. You will also be able to design your own calendar layout, choose months to include, edit text and many more. 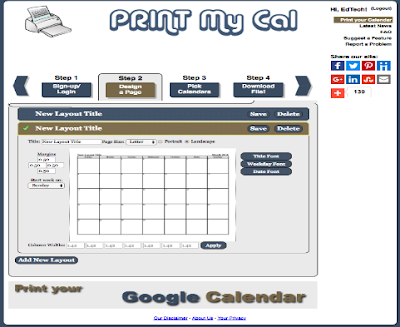 Print My Cal is completely free and does not require any software download. To start using Print My Cal, you need to sign in using your Google account. Once signed in you will be moved to ‘Step 2’ of Print My Cal. In step 2 you get to work on some of the settings of your calendar, for instance, apply a specific column width, set the margins and choose a page size, select the starting day of the week, type in the title of your calendar and choose a layout mode (portrait or landscape). In step 3, you pick the calendar you want to print out and in step 4 you choose the months to include and then click on ‘Prepare Calendar’. You can either open your calendar in PDF format or download it as RTF file.